Season is about to start in a week. Week 1 starts on Thursday 7/27. good start. Kise plays tomorrow! PP-Foolad highlights, base on highlight, Beiro didn't even make a single save. Persepolis today had only Hossein Mahini at 30 years old, the rest of the team were 28 years old or under(with Rabikhah being 29). They have much better bench this year. Naft Tehran: Derakhshan pire marda ro jam kard: Beikzadeh, Bengar, Nosrati, Feshangchi. Sanat Naft 1-0 EsEs - Minute 26. Sanat opened the pocket this year and spent lots of money and got Chimba, Augusto Cesar, Karrar, Magno Batista. Esteghlal playing Azim Gok, 21 years old Gonbadi CD(and Azmoun friend) next to Pejman Montazeri. Pars Jonoubi Bushehr beating 10 men Gostaresh Tabriz 4-1 away. These two teams have been around for more than 60 years. They have played in this very stadium for decades. Yet the mystery of stadium lighting and camera angels continue to baffle the minds of the scientists. tasliat be baro bakse Kise!!! What Esteghlal will do with these central midfielders? 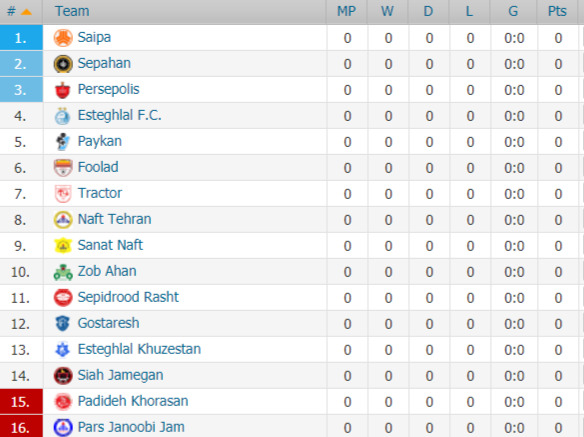 : Djeparov, Jabbari, Shojaeian, Cheshmi, Ebrahimi, Nourafkan LOLL! I guess it was the best match of the week as you well mentioned it base on highlights, Saipa has the best core of young and talented players in the league and probably as we talk are one of the few clubs which produce more talents compare to other teams. What a goal by Torabi, i wished to see the kid already in Europe, he is being wasted in IPL. I think Saipa with Daei will do well this year.